Take a flight from major airports in Japanese main Islands to Ishigaki Airport via Naha (a direct flight to Ishigaki is available from Tokyo (Haneda), Osaka (Kansai) and Fukuoka). From Ishigaki Airport, take a taxi or a route bus to Ishigaki Port (rito-sanbashi) (fare being 200 yen by bus and 700~800 yen by taxi). When arriving at Ishigaki by a sea route, it takes about 15 minutes from the ferry terminal to the rito-sanbashi by walk. From the rito-sanbashi, take a rapid boat of An-ei Kanko or Yaeyama Kanko Ferry, bound for Uehara Port. Take care not to take a boat bound for Ohara Port. The fare of the rapid boat is, one-way 2,000 yen, round trip 3,800 yen, half price for children. Even though a sail bound for Uehara is canceled due to a bad weather condition, in some cases you can get to our hotel through Ohara (when the Ohara route is available). runs during Apr., 1 ~ Sep., 30. runs during Oct., 1 ~ Mar., 30. runs during Jul., 1 ~ Aug, 31. For group tourists and repeating tourists to Iriomote, a book of coupon tickets is advantageous. 10~40 tickets of the coupon are available and the prices of those are totally the same for An-ei Kanko and Yaeyama Kanko Ferry. When the Uehara line is canceled due to a bad weather condition and when the Ohara route is available, you can utilize the Ohara line with the coupon ticket (including a limousine bus from Ohara to Uehara). Although the coupon tickets are valid without time limit, some added charge will necessitate when the normal charges will be altered. For the repeating tourists to Iriomote, 10 tickets of the coupon may be convenient to consume for 2~3 years. 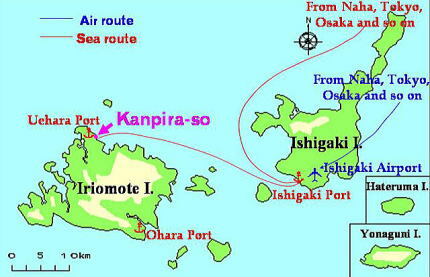 Also, cargo ferries (boats carrying both cargo and passengers) which run Ishigaki - Hatoma - Uehara are available. On Mondays, Wednesdays and Fridays, we have a cargo ferry called "Paikaji" of An-ei Kanko, and on Tuesdays, Thursdays and Saturdays, that of "Kariyushi" or "Heiseimaru" of Yaeyama Kanko Ferry runs. You can carry a motorbike and a car by those ferries. The fare of Ishigaki -Uehara for only a person costs 1,380 yen for both companies, and the time table is as follows. From Uehara Port, you can easily get to Kanpira-so by walk. If you have much luggage with you, please inform us your arrival time to Uehara in advance, and we will pick you up there to Kanpira-so by car. Kanpira-so is located at the center of Uehara Village, where is very convenient because with some souvenir shops, supermarkets and diving services. Also, Kanpira-so faces the sea, having some ocean-viewed rooms upstairs. As our accommodative system excludes dinner, our guests can utilize a restaurant located nearby, or can purchase some food at a supermarket and so on. We do not have any seasonal and special charges, being stable around the year. Unfortunately, a credit card is not available. Please prepare cash with you. All the rooms with free-charged air conditioner, also coin-operated laundries are available. As it is particularly crowded in summer season, we would recommend you to make an earlier reservation. Kanpira-so is available for a family travel with little children. A solitary tourist is welcome. Because solitary female tourists often stay at Kanpira-so, do not hesitate to utilize in such a case. Staying with a pet would not be available, because it may be troublesome for another guests. Please understand it.